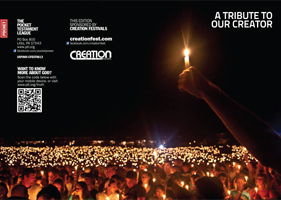 This Gospel is designed in connection with Creation Fest. The vision of the festival is to present the Gospel through music, teaching and any other creative means so that those attending will be drawn to salvation and discipleship in Christ. At Creation Fest, thousands come together to give tribute to God the Creator and to allow His Spirit to birth many new "creations" in Jesus Christ who will love and serve Him. This cover is perfect to use to connect with a music lover, concert goer, or avid musician. Shown is the front and back cover spread.